Clean, Drain & Dry: Stop Zebra Mussels! 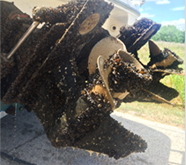 STOP THE SPREAD OF ZEBRA MUSSELS! This destructive invasive species can ruin shorelines, impact recreation, hurt aquatic life, damage boats, and even clog water intakes, costing taxpayers millions of dollars. If you’ve been on an infested lake and don’t properly clean, drain and dry your boat or gear, you are at high risk for spreading zebra mussels to other lakes. NOTE: Click on a lake's marker to see the name of the lake and its level of infestation. Definitions of Levels of Infestation -- Infested Lake: has an established, reproducing population. Tested Positive: multiple/repeated detections of zebra mussels at that lake (but no reproducing population). Zebra mussels start as microscopic larvae and grow to only 1.5 inches long. They can spread across Texas by hitching a ride on your boat, trailer or gear. Do your part to protect Texas lakes. Always clean, drain and dry your boat. It's the law -- fines up to $500. 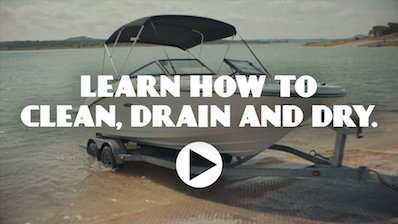 If you've stored your boat on a lake known to have zebra mussels or find zebra mussels attached to your boat, call Texas Parks and Wildlife for guidance at (512) 389-4848 before moving it. Learn more about zebra mussels. Possession or transportation of zebra mussels in Texas is illegal. Boaters must also drain all water from their boats, including live wells, bait buckets, bilges, motors and any other receptacles or water intake systems before leaving or approaching public waters. This applies to all types and sizes of boats. Violations are Class C misdemeanors for the first offense, punishable with a fine of up to $500. Learn more. Sign up to receive free emails or text messages with the latest news on zebra mussels in Texas.